Soon after gold was discovered at Teetulpa in 1886, there were reportedly 2,000 gold diggers living in the makeshift town. (Terowie enterprise 29 October 1886, p. 2) The small settlement contained shops and businesses, a bank, hotel, hospital and church. But by the middle of the following year the gold was giving out, and the population dwindled. At the height of the rush an English printer, Robert Osborne of the Port Augusta dispatch, began a newspaper for the miners. Only one issue of the newspaper (number 11) is known to still exist. It contains advertisements for local businesses, brief news items, stories and poems. Local news includes reports of cases of typhoid fever, a visiting "Indian tourist"' and "Lady minstrel" company, and a "Christian mission service" held to raise funds for the local destitute poor. 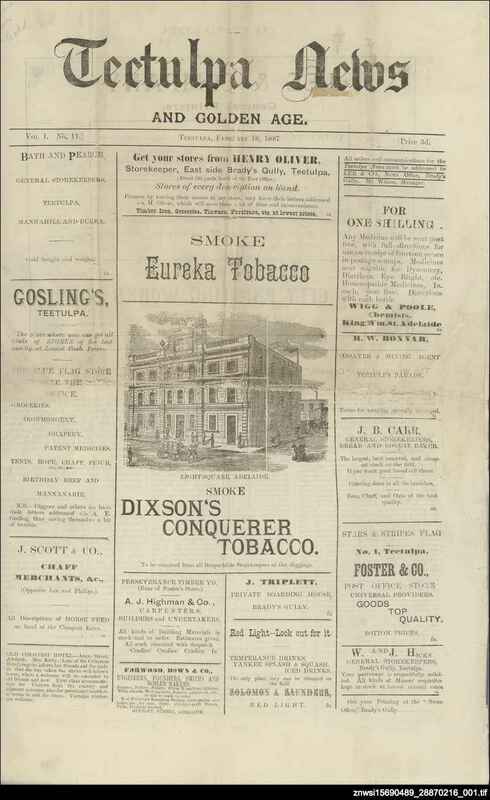 The newspaper was closed by mid-1887 and Osborne moved to Adelaide. However, he was approached to begin a newspaper at Petersburg (Peterborough) and returned to the mid-north to found the Petersburgtimes.